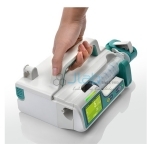 The Syringe Pump provide may be a medical infusion pump that is designed to offer controlled quantities of fluids to the patient. Fluids administered may vary from blood, medicinal formulations and numerous health boosting nutrients. This Syringe Pump is mainly applicable in fields associated with in medical treatment, and is even demanded for relevance in analysis work. Jainco Syringe Pump provide are safe to use and prevent entry of air bubbles which may cause varied health hazards. These pumps should be used under proper medical supervision only. 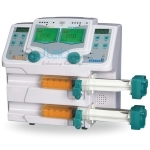 Jainco is renowned Syringe Pump Manufacturer, Syringe Pump, Syringe Pump Suppliers, Syringe Pump Exporter, Syringe Pump in India, Infusion Pump, Syringe Pump Manufacturers in India. Freely stackable: Anyone freely stack one onto another to provide multiple solutions.